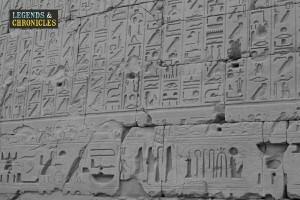 Ancient Egyptian education was a system which was implemented to educate the young children in various subjects and topics. Common subjects included in ancient Egyptian education were reading, writing, mathematics, as well as religious instruction and morals. Education was held in high regard and it was common for people with proper means to send their children to schools after a certain age. However, girls were not sent to school and instead their education was conducted at home. Mothers were the source of education for girls who instructed them in various disciplines such as sewing, cooking, and reading etc. These tasks were considered socially important for women and education beyond that was thought superfluous for women. People of lower classes usually could not send their children to schools because of the limited number of schools, and these schools were typically reserved for children from royal and rich backgrounds. It is not possible to trace the exact history of ancient Egyptian education system. What we are clear of today is that a certain form of education system existed throughout the known history of ancient Egypt. Education was also necessary for the elite of Egyptian society because royal offices generally remained in the same families for years, thus it was customary for children of these families to be instructed in the required disciplines. It is possible that the history of the ancient Egyptian education system had its roots at the beginning of Egyptian Kingdom in 3000BC, However, this can only be speculated in the absence of any concrete historical and archaeological evidence. 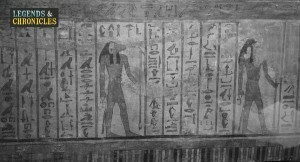 A painting depicting Egyptian Hieroglyphics the common language and writing form in ancient Egypt. There was a certain way the ancient Egyptian education system was implemented, and it was common for boys to be sent off to schools from the age of eight. The most important subjects taught at schools were mathematics, reading, writing, arithmetic, geometry, geography, astronomy, medicine, and moral instruction, all subjects which can be seen as important topics in the Egyptian society of the time. After being instructed in various disciplines, it was common for boys to follow the line of trade of their fathers. Thus the children of royal officials typically became royal officials when they grew up and same was true more or less for the people from other professions. Proper timings were followed in the ancient Egyptian education system. School started in the morning and a break was given at midday with the rest of classes then commencing later in the afternoon. Schools that taught ancient Egyptian education were generally attached to religious temples or government buildings. This implies that education was constantly monitored and molded by the authorities. People who acted as teachers were generally priests of the temples or government officials acting as scribes. Writing material for younger students consisted of wooden tablets to which material was copied from existing documents. The tablets could be wiped clean after there was no further space left. For older students, use of papyrus was allowed. There were different types of ancient Egyptian schools for different people. For instance, there were general village schools that instructed in preliminary education and there were schools that gave specialised education for specific careers such as a priest or a scribe. At the top of this hierarchy of schools was The Prince’s School which was the most prestigious school and was attended by the sons of the Pharaoh. In addition to that, children of nobles and court officials were also educated in The Prince’s School. Much of the Egyptian education was based around learning to read and write. People who acted as teachers to impart ancient Egyptian education can broadly be categorised into two kinds: priests and scribes. As if evident, each of these classes has certain predefined roles to play. For instance, the role of priests was to impart moral and religious education for the children. Scribes, on the other hand, had secular duties to perform. For instance, he would teach children to read and write and then go on to teach them other subjects like mathematics and medicine. Unlike the modern schools, there were not different teachers for different subjects in the ancient Egyptian education system and sometimes the same scribe would teach all the subjects. This was particularly common in village schools where general populace was instructed. Specialised instructors were found in schools that aimed to teach a specialised education. For instance, there was a certain form of education called “Instruction of Wisdom” which consisted of lessons on ethics and morality. Other kinds of specialised education included the education of medicine for doctors, mathematics for construction work, and such. A broad variety of subjects was taught as part of ancient Egyptian education. For younger students, the subjects were generally confined to reading, writing, and basic forms of mathematics. The range of education expanded as students grew old and included such subjects as medicine, mathematics, geography, history, music, and science. Books of Instruction were used in ancient Egyptian education which included instruction on a diverse range of subjects such as morality, ethics, humanity, and others. After the completion of preliminary education, most students went on to join the professions of their fathers. But it was also not unusual for students to choose the path of specialised education in various subjects. This specialised or higher level education was focused on producing skilled individuals. Specialised education was also imparted to the children of nobles and royal officials who were instructed accordingly. The Ancient Egyptian education system was elaborately formed and was structured to the current social and political needs of society. Hierarchy of social status and classes was maintained in education too, as is evident from the fact that different schools existed for commoners, nobles and royals. The education curriculum in ancient Egyptian education system was well-rounded and instructed children in almost all forms of knowledge that existed at that time. While girls could not go to school, they were sometimes given education in certain disciplines that were considered fit for women. This included dancing, weaving, and baking. Girls of nobles and royals could read and write as well, even though this freedom was not available to the girls from lower classes. The purpose of ancient Egyptian education, other than forming educated individuals, was to maintain the structure of society as it was envisaged by the ruling class of the time. The Ancient Egyption Education system was well ahead of its time and was one of the reasons that the Eyptians became so dominant in the Ancient world as we know it.